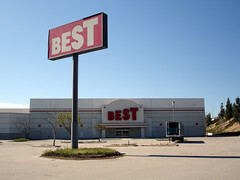 Best Products Co., Inc. (also known as BEST) was an American chain of catalog showroom retail stores. The chain was founded by Sydney Lewis and Frances Lewis in 1957. 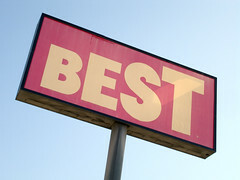 Best grew into a publicly traded company with a chain of over 169 retail stores in 23 states. The company filed for Chapter 11 bankruptcy protection in January 1991 and again in September 1996. Best distributed photographic products under the trademarked Albinar brandname. The products were manufactured by other companies. Best also used the Albinar mark on other types of consumer electronics such as pocket calculators. Modern users of Albinar lenses should note that some Albinar lenses sold as Pentax K Mount were actually Ricoh mount lenses modified to be compatible with manual focus Pentax K Mounts of that era. These lenses are marked KR. They will work as expected on Pentax K-mount cameras of the same era but may become stuck on newer K-mount cameras. This is not a serious problem and will not damage the camera or lens. It can be fixed by removing an unneeded pin. This page was last edited on 5 November 2018, at 11:41.